Help! Sold MJ and Bought plus.. but cant transfer it? $10 Expired MJ's For GVJack App + Google Voice. MJ Ready Thin Clients on Sale Now From Just $55 Shipped!! 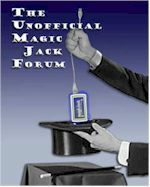 MagicJack and MagicJack Plus - bundle for sale ! Anyone looking to sell their Hawking Broadband Booster?